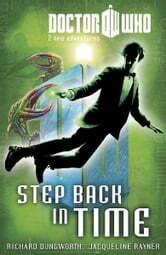 Exciting action-packed new original fiction for younger Doctor Who fans, starring the Eleventh Doctor with his companions Amy Pond and Rory Williams. Step Back in Time contains two fast-paced, fun-filled adventures! The Water Thief sees the Doctor, Amy and Rory visiting an archaeological site in ancient Egypt. They soon realise there's something unearthly being dug up and it wants all the water it can find...!